It is a tragic reality that many Israeli children have been orphaned due to terrorist attacks, accidents and illnesses. As the remaining parent struggles to cover the family’s daily living expenses, the children are beset with worries and anxiety due to the loss of one parent and the poverty pervading their home. Many families cannot imagine how they will cover the cost of a child’s wedding especially when it is a daily struggle even to put food on the table. The joy of a child’s engagement does not dispel the gloom and sorrow in the home, but only increases the widow or widower's worries. 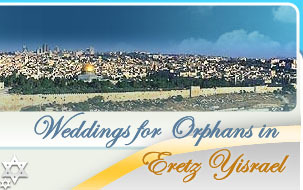 In November, 2001, a group of individuals formed Simchat Tzion to cover the wedding costs of needy orphans. The organization hired one of Jerusalem’s premier caterers to cater Simchat Tzion-sponsored weddings at a low cost. 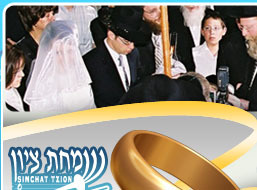 Thus, Simchat Tzion beneficiaries are able to celebrate their weddings unmarred by anxiety from financial pressures. Simchat Tzion operates on the principle that the weddings it sponsors should be indistinguishable from standard Israeli weddings. The couple’s families meet with the caterer prior to the wedding to plan the affair. The wedding takes place in a catering hall chosen by the family. The wedding guests have no idea that the affair is underwritten by a charity organization. Simchat Tzion’s only involvement in the affair is to write a check to the caterer at the end of the wedding. Simchat Tzion’s unassuming role coupled with the modest elegance of its weddings have earned Simchat Tzion acclaim throughout Israel and the world. Leading rabbinic authorities in Israel and the United States, including the Chief Rabbi of Israel, have warmly endorsed the organization. Simchat Tzion’s reputation has also reached the ear of Israeli orphans. Almost daily it receives calls asking it to underwrite another orphan’s wedding. 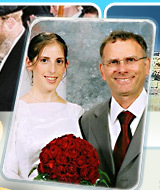 To date, Simchat Tzion has sponsored over 1,800 weddings. Since it doesn’t have the resources to underwrite a wedding for every Israeli orphan, Simchat Tzion has set objective economic criteria to determine who is eligible for assistance. Each applicant is carefully screened by a grant committee whose inquiries are strictly confidential to protect the privacy of the applicants. Simchat Tzion’s director, fundraisers, and grant committee work on a volunteer basis. It does not rent office space and has minimal overhead costs. Just about every dollar contributed to Simchat Tzion goes directly to covering wedding costs. Simchat Tzion funds are completely derived from the generosity of donors. Many supporters have given donations to coincide with the day when they themselves celebrated a wedding or other joyous occasion in their family. They knew that their own happiness would be enhanced by helping an orphaned bride or groom marry at the same time. Other donors have contributed as a merit for a sick family member or friend, in memory of a loved one, or simply out of a sense of empathy for the plight of orphans. Simchat Tzion asks you to join us in sponsoring all or part of a wedding by selecting from our Upcoming Weddings or by Contacting Simchat Tzion today! Together we can make an orphan’s wedding day a beacon of true happiness. Torah leaders from around the world enthusiastically support Simchat Tzion’s work and urge generous individuals to support its noble goals. Please see our Haskamot page for those approbations.